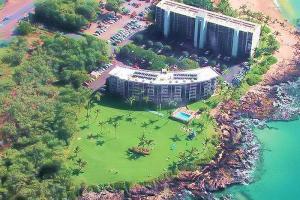 The Kihei Surfside resort consists of an absolute oceanfront building of 6 floors and 84 deluxe units with an elevator. The Shops at Wailea are close by and Kahalui airport is just twenty minutes away. The property itself features an extensive and immaculately kept lawn area, with a heated swimming pool and community barbeque facilities. Located just 20 minutes from the Kahalui airport.